Overcrowded warehouse is a common thing even with the numerous advances in the storage solution technology. Unfortunately, overcrowded warehouse can seriously affect the efficiency of your business and therefore affect your profit margins. Also, not to mention the fact that if your warehouse is not clean and you do not have enough space, your capacity to take new stock in is limited. This can negatively affect your sales. If you want to increase the overall efficiency of your, ensure your warehouse is tidy and organized at all times. The best way to achieve this is by investing in quality warehouse shelves. This will ensure you have enough space to keep your stock and employees safe. It also means that you would not be forced to move to a larger facility in order to accommodate all your products and equipment. Imagine how much you will save. Get Rid Of Any Unwanted Items – Getting rid of items may seem as a waste of money, but the fact is that with the items that are not selling, you are wasting money storing them. They occupy valuable space which could be used for other items that actually bring profit. Slash the prices to get rid of unwanted items quicker or donate them. Clean Up The ‘Returned Products’ Section – Warehouses are full of products that are damaged or returned. They also take up valuable warehouse shelves space. In fact, figures show that almost 30% of warehouse storage shelving space is occupied up by such items. It is vital is to clean your warehouse and use the whole space much productively. 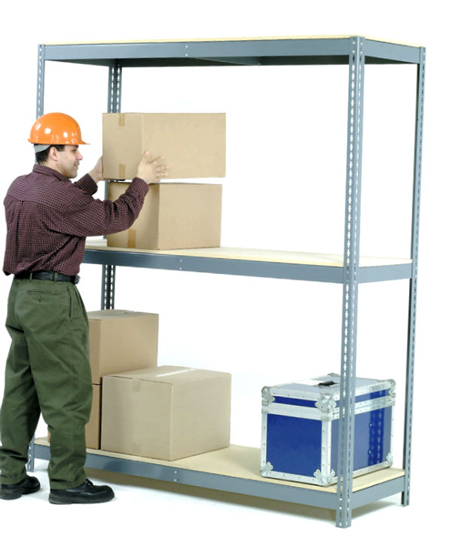 Instal New Storage Shelving – Many companies have warehouses that are full with pallets and storage shelving systems not suited for storing inventory. It’s therefore essential to install new heavy duty shelves and make sure you’re using the most of the your warehouse space. Installing heavy duty shelves will increase the amount of space you can use to store your products. Modular storage shelving is thinner than pallets and will increase your storage space. Heavy duty shelves allow you to store products safety and in a more organized manner, which will improve efficiency and space. Drop Shipping – An alternative way to save on storage space is to not store certain items at all. Many manufacturers ship their products directly to the customers. This is also known as drop shopping and can save you storage shelving space which you can utilize for other means. Keep On Top Of Your New System – It is crucial, once you have installed new warehouse shelves and organizes your warehouse to implementing regular cleaning routine to ensure everything is in order.